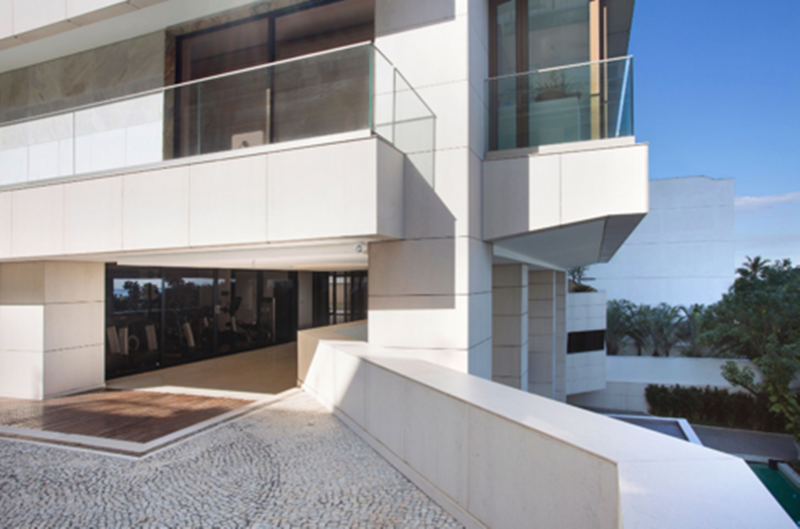 Cosentino is proud to share that its Dekton® surface was selected to be used in the refurbishment works carried out on the iconic Cap Ferrat iconic residential building located on the exclusive Avenida Vieira Souto in Ipanema, Rio de Janeiro. Between 2013 and 2016, the cladding of the building's balconies were remodelled using Cosentino's Dekton® surfaces, to repair the cracks on the original granite pieces that sheathed the perimeter beams of the balconies caused by the galvanic corrosion of the aluminium parts of the railings. Originally built in 1976, the 20-storey high Cap Ferrat is an iconic feature of Ipanema, with a total surface area of 2,000 m2, and includes flats, duplexes, garages and spaces for public use. Says Juan Carlos Di Filippo, Architect: "As we had decided to keep the existing cladding, we had to choose a cladding material with very particular properties: its porosity needed to be as low as possible in order to resist the damage caused by a seafront environment; it needed to weigh as little as possible, but have large dimensions; and it needed to be able to be installed using the system of stainless steel inserts. Last, but not least, it needed to have a low level of solar absorption (characteristic of the area), as well as to suit the chromatic tones of the beach sand, as the Cap Ferrat is located on Ipanema Beach. After analysing several materials, the choice fell on the ultracompact surface Dekton® by Cosentino. It united all the requirements set for the project." One of the main challenges faced by the working team was sourcing for a new cladding that could be installed over the original and that would weigh no more than 90 kg per square meter. At the same time, due to its proximity to the ocean, the material chosen needed to possess mechanical properties that could resist the deterioration and weathering caused by an ocean-side environment. Another consideration was for the material to suit the relaxing aesthetics of the beach-side environment, offering gentle, agreeable colours for its surroundings. As such, the beautiful cream Dekton® colour, Danae, was the colour of choice, for its elegance and chromatic similarity to the colour of sand. Dekton® by Cosentino was the natural choice for the façade because it weighed only 50% of the total maximum weight. Also, because it could be made in large-format slabs (3.2 m x 1.44 m) and custom sizes, this made Dekton® ideal for precise cutting and customisation for the cladding. Its other mechanical qualities such as its high resistance to UV radiation, colour stability and high stain resistance makes for exceptional performance when faced with future erosion caused by beach sand and salt residue. The customisation of the 12 mm-thick pieces used for the project, which included cutting and the precise drilling of the holes, was carried out at the Cosentino factory in Cantoria, Almeria (Spain), before being shipped to Brazil. The holes were made through a novel anchoring technique designed for the project by GMM Anchor Systems, in an ongoing collaboration with the Cosentino engineering department. Keil pieces provided by Cosentino were used for the anchoring, while the rest of the pieces and metal accessories were made by GMM.